When we took down the awning in the back, a lot more light came into the laundry room, and it shone directly on the cat box. This was unpleasant, so we converted the Accordion Room into a storage room/cat room with a fan blowing smelly air right out the window. But now that the heat is back on, we noted that a lot of heat was blowing out that window, too. Our solution: hack a cat flap. Obviously, we were not going to cut a hole in our door for the flap -- these doors are impossible to replace. But they're also non-standard sizes, so we couldn't just buy a cheap hollowcore door to replace it temporarily. 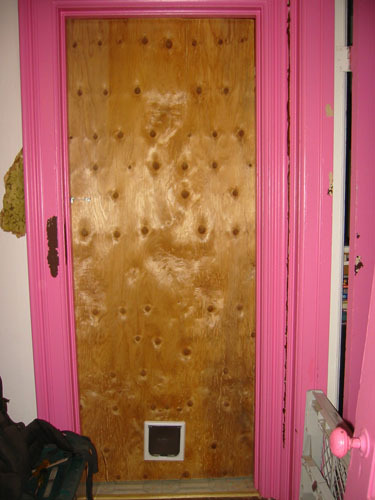 First step: remove the old door, which involved chipping away layers of paint on the hinges. 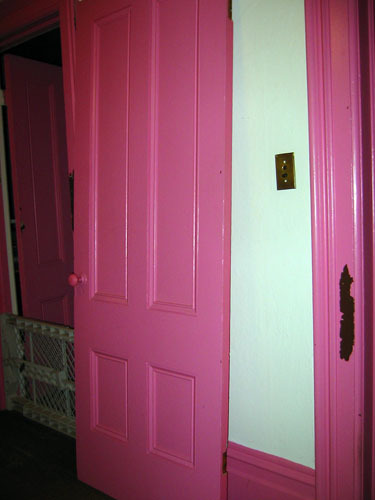 This actually serves two purposes, because I've been thinking of sending a door out to be dipped -- have the nasty pink paint stripped -- and couldn't decide which door to use, because we actually use all of the rest of our doors. Now I have a candidate. I just have to get the hardware off it. 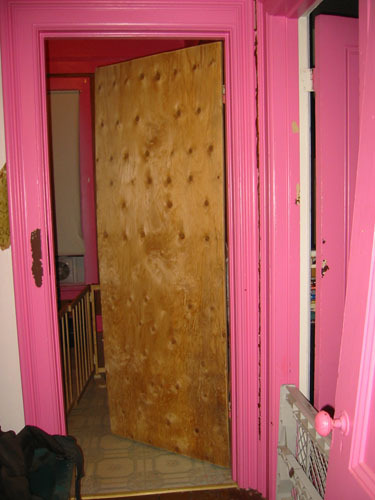 I cut a piece of plywood to size, and we hung it from the hinges on the old door. A little hook and eye closure (there was one installed on the door when we moved into the house, so no new holes in the woodwork) keeps it shut. Then we installed a cat flap in it. With a day of hysteria on the cats' part and some training on my part, we have them going in and out through the flap, and less heat is escaping from the upstairs. I still need to tack insulating foam around the edges, but this is a good start. I am reading in order of your archives so ignore if you answer this and I haven't gotten to it yet, but if you dip the door and strip the frames and banister yourself do you run the risk of varying the quality of the strip? That's a good question, and you're right: the dipped woodwork comes out looking sort of greenish, while the hand-stripped woodwork will look more like its natural colour. On the other hand, I'm not terribly concerned about that because at some point when we realized we had to replace a bunch of removed or majorly dented/gauged woodwork and were despairing of ever getting anything to match 130-year-old redwood trim, we decided to paint all the doors and trim white in a traditional Victorian style; the dipping is mostly to remove fifteen layers of thick, peeling paint and bring out the lines more crisply. The railing we will leave wood, because it is more of a focal point and even better, it is intact. So in the end it won't matter, because the difference won't be visible.